A Wellington woman who battled cancer in her 20s will receive a dream wedding that will be televised live Tuesday on the Lifetime channel. 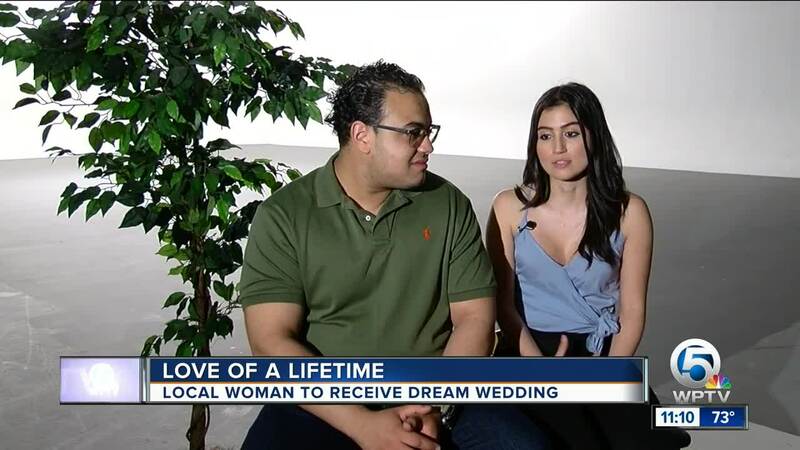 WELLINGTON, Fla. — A young Wellington woman who has battled cancer will receive a dream wedding that will be televised live on the Lifetime channel. Kristin Moya was just 22 years old when her world was turned upside down. "I was diagnosed in 2016 with stage-two breast cancer, and I battled through chemotherapy bilateral mastectomy and radiation. And the following year I was diagnosed with thyroid cancer," said Moya. Her boyfriend, Luis Polanco, who she has known since she was 14 years old, was by her side through it all. "Because it got questionable at times but like I said you put your head down, and you go through the obstacle and hope for the best," said Polanco. Once Moya was in remission, the Wellington couple got engaged. "My mom actually wrote David Tutera telling him about my cancer story and how I was getting married," said Moya. Tutera is a celebrity wedding planner. His assistant called and picked them to have a dream wedding. My Great Big Live Wedding will be televised live Tuesday night. "I won't know what my wedding dress will look like until the day of the wedding," said Moya. "I love it. I think that not knowing and not having control sometimes is a little bit better than having to make the decision," said Polanco. When she walks down the aisle, a local pastor and her bridesmaids will be there. One of the bridesmaids is Mary-Madison Sims. "For someone so selfless to get something so special, she totally deserves it, and Luis is the greatest and such a support," said Sims. Pastor Jim Sims will officiate the wedding. "It's hard to believe that we are at this point finally, not only the time she went through the struggle, but just these months of getting prepared and getting ready. Now, we are here and it's really exciting," Moya added. "It's so incredible to be so fortunate enough to be blessed by God that I'm still alive, I'm still here, I'm still living and I have so much to do in this life." My Great Big Live Wedding will be televised live on Tuesday at 10 p.m. on Lifetime.